This programme is aimed at those who would like to combine technical know-how with close patient-relationships, who would like to understand complex and multidisciplinary relationships at the interface between medicine and technology and use these to implement solutions for the benefit of the patient in close cooperation with medical staff. Our graduates work together with doctors during technically supported interventions, or in industry where they can contribute their medical and technical knowledge, e.g. in product optimization. You also have the option of gaining the "European Board of Cardiovascular Perfusion" Certificate at our University. During the programme you will gain an understanding of future-oriented, innovative technologies and intelligent instruments and devices, as well as new strategies and diagnostic and therapeutic procedures. Depending on your previous knowledge, you will gain a better understanding of the various specialist areas of medicine in which modern technologies are already used in both the primary and follow-up treatment of patients. This will enable you to understand how the technology functions and its interaction with the human body. Use and application of medical technology in specialist areas such as cardiology, oncology, urology, gynacology, ENT, ophthalmology, orthopaedics, diagnostic and interventional radiology. State-of-the-art special anaesthesiology and critical care medicine using life support systems and extra-corporeal circulation. Problems which arise in using these technologies and strategies to deal with possible complications. 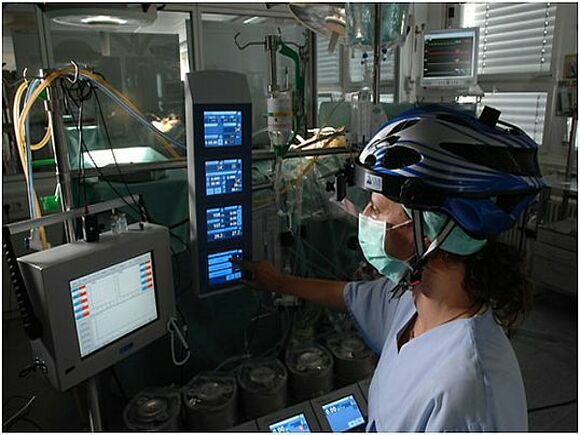 You will gain knowledge of the implementation possibilities and limitations of various technical medicine methods (extracorporeal systems, life support systems, minimal invasive systems, navigation systems, intelligent instruments, etc.) In an independently carried out clinical research and development project, particular importance is placed on self-directed work following the principles of good scientific practice. You can also take an elective from other master's programmes according to your interests. Use of surgical and interventional methods using cardiac catheters, neuroradiology and other assistance systems as examples. Technology and functionality of robots, navigation systems, endoscopes, neurosurgical systems, intelligent instruments and implants. Particular problems and complications of such areas of application. Equipment for extracorporeal circulation, its function, construction and materials in the field of oncology/ HIPEC, assist devices, emergency services, intensive care medicine and in transportation. Particular problems and possible complications in this field of application. In an independently carried out research and development project, particular importance is placed on self-directed work following the principles of good scientific practice. The master's thesis, written in the final semester, allows for the development and/or use of autonomous application or research-oriented ideas. It is possible to specialize depending on existing knowledge and personal interest, e.g. in R&D, medical device and clinic management, or cardiovascular perfusion. Both the research project and the thesis can be chosen from these fields. Click on each module below for an individual module description.